Este texto foi escrito por Ker Than para a Nacional Geographic News tendo sido publicado no dia 5 de Abril de 2012. Esta historia faz parte de uma serie especial da Nacional Geographic News sobre problemas globais da Água. O autor relaciona o aparecimento de doenças nos povos indígenas da América do Norte com alterações do clima, como o aumento da precipitação e o aumento da velocidade do degelo, que resultaram na diminuição da qualidade da água nestas regiões e ao consequente aparecimento, ou aumento, de doenças nestas comunidades. Os Sintomas mais comuns foram vómitos e diarreia tendo resultado estes, presumivelmente, da ingestão de águas não tratadas, sendo esta uma prática reiterada dos povos da região. O autor menciona também a mudança de hábitos e a desconfiança das novas gerações pelos conhecimentos ancestrais, transmitidos de geração em geração, na medida em que estes, atendendo às mudanças climatéricas que se fazem sentir nesta região de forma mais acentuada, já não são precisos nem fiáveis. Conclui-se pela necessidade de adoptar uma postura pro-activa que conduza à adaptação dos povos, a uma nova realidade. As global warming triggers heavier rainfall and faster snowmelt in the Arctic, Inuit communities in Canada are reporting more cases of illness attributed to pathogens that have washed into surface water and groundwater, according to a new study. "In the north, a lot of [Inuit] communities prefer to drink brook water instead of treated tap water. It's just a preference," explained study lead author Sherilee Harper, a Vanier Canada graduate scholar in epidemiology at the University of Guelph in Ontario, Canada. "Also, when they're out on the land and hunting or fishing, they don't have access to tap water, so they drink brook water." 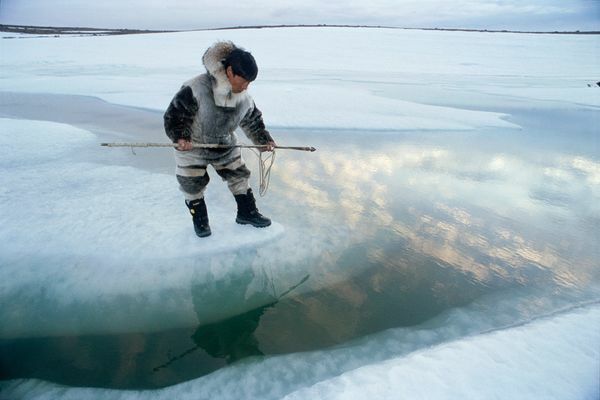 The experiences of the Inuit and other indigenous communities as they struggle to adapt to changing climate conditions could help guide humanity in the coming years when the effects of climate change are felt universally, scientists say. "These societies are like crystal balls for understanding what could happen when these changes start materializing over the next few decades down south, as they surely will," said James Ford of McGill University, an expert in indigenous adaptation to climate change who was not involved in the study. "Scientists often talk about how if global temperature increases by 4 degrees Celsius [7°F], there will be catastrophic climate change effects, Ford said, "but where I work in the Arctic, we've already seen that 4-degree Celsius change." Ford said the new study is the first to draw a link between climate change and disease in Canadian Arctic communities. "Water issues have been largely neglected in the [climate change] scholarship," he said. "Before this study, there was very little understanding of the burden of illness of waterborne disease in the Arctic . . . The baseline that we have from this study will allow us to track whether changes in behavior make a difference in the future," said Ford. Harper's Inuit research, published in a recent issue of the journal EcoHealth, is part of a multiyear comparative study of how extreme weather events affect waterborne disease outbreaks in aboriginal communities around the globe. The team is conducting similar studies among the Batwa pygmies in Uganda and the Shipibo people in Peru. The trials are still under way, but preliminary results suggest that, like the Inuits, these groups are also starting to feel the health effects of climate change-related weather patterns. For each of the communities studied, Harper and her team documented the local weather patterns using weather stations; conducted weekly water tests; and searched clinical records for reports of vomiting and diarrhea. The team also conducted surveys to gather information about local lifestyles. Combining and analyzing these various data together uncovered some interesting patterns. For example, "our research found that after periods of heavy rainfall or rapid snowmelt, there is an increase of bacteria [such as E. coli] in the water, and about two to four weeks later there is an increase in diarrhea and vomiting," Harper said. In Uganda, the team found that families that don't keep their animals in shelters are about three times more likely to get sick after periods of heavy rain. The team suspects pathogens from the animal feces are getting washed into the drinking water. Harper's studies are part of a larger endeavor—the Indigenous Health Adaptation to Climate Change, or IHACC, project. It aims to combine science and traditional knowledge to strengthen health systems in indigenous communities. One of the IHACC project goals is to use data from the studies to advise local policymakers and help develop ways to improve the health of those in the affected communities. Strategies for reducing waterborne disease, for example, might be as simple as building animal enclosures or establishing protected sources of water for drinking, Harper said. In Rigolet, a small Inuit town studied by Harper’s team, the findings from the study have already led to changes in the community, said Charlotte Wolfrey, mayor of the town. Wolfrey, who has spent nearly 40 years of her life in Rigolet, says that climate change has forced the people in her town to question things that were once taken for granted, such as places in the ice where one can safely cross, or seasonal water routes for boats. The lessons learned in Rigolet and other indigenous communities could someday benefit humanity as a whole because their problems could soon become global problems. According to the World Health Organization (WHO), for example, most of the climate change-related disease burden in the 21st century will be due to diarrheal diseases. "The climate change impact on waterborne disease is not just an Arctic issue, or just an indigenous issue," Harper said. McGill University's Ford agreed. "If we look at what happens in the Arctic and how climate change plays out with its societies and people, we'll increase our understanding of how as a globe we are going to respond to climate change," he said. Ford says his time among the Inuit has made him "cautiously optimistic" that climate change is a problem that humans will be able to adapt to, if not solve. "When I first went to work up north more than ten years ago, there were all sorts of news reports about how climate change was going to threaten the Inuit. But when I started working with them, the thing that struck me is that many people said, 'We're resilient. We'll adapt.' So I think we'll stand a good chance of weathering whatever changes might happen," Ford said. But, he added, "Things will have to be done to get there. We can't just wait and hope we adapt. We have to be proactive."